Ship traffic through Mediterranean basin daily consists of 2,000 ferries, 1,500 freight ships and 2,000 commercial crafts, 300 of them are tankers (20% of the world amount of oil sea traffic), carrying more than 350M oil tons per year (8M barrel per day). The scope of the proposed ARGOMARINE Project is to develop and test an integrated system for monitoring of the marine traffic and pollution events due to carriers/commercial ships as well as recreational boats through environmental-sensitive sea areas. This monitoring will be implemented by means of electronic, geopositioning, and tools for transmitting ship navigation data through a high speed communication network. Environmental data from different sensors (SAR, hyperspectral sensor, thermal sensors, electronic noses, acoustic sensors) on satellites, aircraft, vessels, in situ anchored buoys and AUVs will be collected in test areas, and sent by telemetric links to a central server where all the data are integrated by use of web mapping technology. Accident modelling and post-accident intervention simulation tools for impact prediction will be implemented and tested through field experiments. To monitor marine pollution, data from both satellite and airborne remote sensors and in situ sensors on vessels and buoys will be used to derive information about water quality and spread of hydrocarbons/oil slicks over large areas. Vessel and airborne support will be provided by Italian Coast Guard and Foresters Corps. Other data will come from electronic nose technology, which is being shown as effective to monitor oil/hydrocarbons leakage in marine water. The final sensor device will be scale-reduced and hosted on an autonomous buoy. An electronic control will supervise the performance and the activation of the sensor device. At the same time, tracking of sea ship traffic will be accomplished by ARGOMARINE technology. The system will act as an intelligent transponder through either satellite platforms or ground-based stations. External data such as weather station data, weather operational models and large scale hydrodynamic and wave models will be gathered from the external providers. Local implementations of high resolution mathematical models will be developed for the study sites. The modelling system will include a 3D hydrodynamic model a wave model and an oil spill model. The modelling system will be run in pre-operational mode, downscaling the solutions of existing global/Mediterranean operational models. 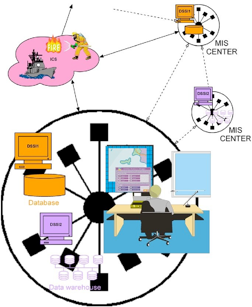 All the data and the information obtained will be merged and elaborated in a Marine Information System (MIS), i.e. an information system where remote sensing data, field experiment results and estimates from simulation models can be integrated, and tools for data storage and retrieval, data manipulation and analysis, as well as for presentation, are available through a common interface.